You'll need cash to pay for home improvements. To make your home truly your castle, you might want to make a few improvements. Enlarge that master bedroom, update the kitchen, turn the basement into the dream man-cave you’ve always wanted. Whatever projects you dream up, you can do them – provided you come up with the cash to pay for it all. Finding the Benjamins to make your dream a reality might require jumping through a few hoops, but the money is out there. 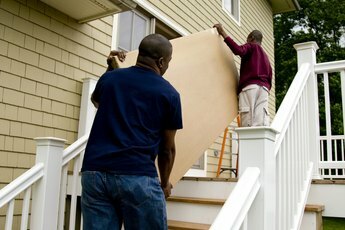 Make your house pay for itself by using the equity you have already built up in the home to pay for improvements. With a home equity loan, you borrow the amount you need for the remodeling project and repay it over a set period with set monthly payments. This is a good choice for a one-time project with a fixed cost, such as installing all new windows or building a deck. Interest payments are tax deductible. 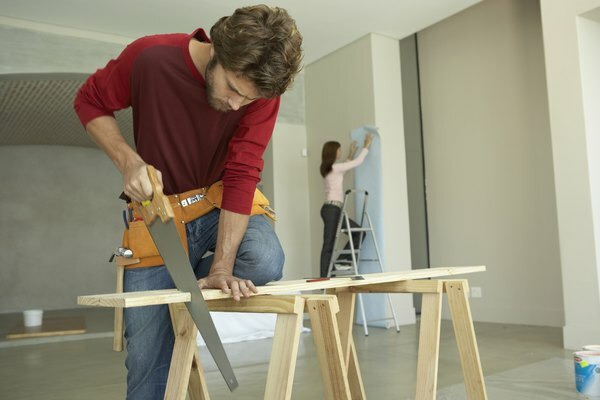 Since home improvement projects can increase the value of your home – and thus, increase your equity – you’ll come out ahead once the loan is paid off. You can also open a home equity line of credit, or HELOC. This is a flexible account in which you establish a line of credit that represents a percentage of your equity and draw on the credit as needed. You must pay the interest each month and have flexibility as to how much of the principal you pay monthly. The line of credit stays open and you can use it again in the future for another project or for emergency bills. If you’ve slated a major remodeling project such as an addition or a kitchen remodel, which involves multiple payments to multiple suppliers and subcontractors, a HELOC is a smart choice. The interest you pay on a HELOC is also deductible on your taxes if you itemize. Charging big projects on your credit card can be a way to run up expensive debt – or a smart way to leverage your credit. It depends on the project and on your credit card. 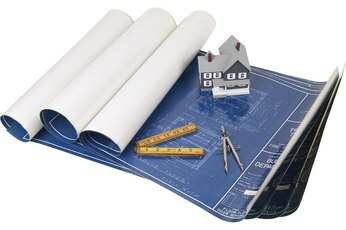 Smaller projects of a few hundred dollars aren’t worth the paperwork of taking out an equity loan. If you luck into a low introductory interest rate for a year and you know you can pay off the home improvement charges in that time, charging the project to the credit card can make sense. Another option is to open a store credit card at a home improvement center. Sometimes these stores will offer “no interest for six months” deals that give you an interest-free six-month loan on the flooring, appliances or other materials you buy and charge to the card. If you’re a do-it-yourselfer and you’re disciplined enough to make the payments on time, this option can save you money. If you participate in a 401(k) at work, you might be able to borrow from the account and repay yourself through payroll withholding. You can’t borrow more than 50 percent of the vested balance of your 401(k) account, up to a maximum amount of $50,000, and you have to repay the money within a specified period, usually five years. If you lose your job or quit during the payback period, you’ll have to repay the loan right away, or be subject to penalties and interest. Another option is to borrow against investments or against your life insurance. All these loans may require less paperwork and less time to process than home equity loans, but they carry with them the risk of losing either your insurance or your investments. Plus, the interest you pay on these loans isn’t tax deductible. 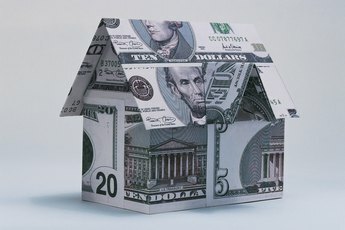 Why Choose a Home Refinance Loan Over a Home Equity Line of Credit? Which Type of Home Equity Loan Best Suits Your Needs?